Brian Fies and his wife, Karen, fled from the Tubbs fire early in the morning of Monday, Oct. 9. They carried only what they could grab in a hurry. The next day, Fies, 57, came back to Mark West Estates to see if his house was still there. He found nothing but smoke and ash. In that regard, Fies is no different from thousands of other North Bay residents who lost their homes in the worst wildfires in California's history. The only thing that sets him apart is that, after seeing the burnt remains of his house, Fies, a professional cartoonist, almost immediately sat down to write a comic about it. "Frankly, it was the first thing that occured to me," he says. In the months since, Fies' short online comic, "A Fire Story," has gone worldwide. Major publications, such as NPR and KQED, have featured the story, and it has gotten praise as a poignant and accurate account of what thousands of people in and around the North Bay are going through. "That's the reaction that touches me the most," Fies says, "when somebody says, 'I didn't understand what this was like until I read your comic.'" Fies' contemporaries in the Bay Area agree. "I think he went a long way toward explaining how all of Santa Rosa felt about those fires in a really effective, graphic way," says Stephan Pastis, Fies' friend and creator of the daily comic Pearls Before Swine. He "distilled it all really simply." This is not the first time Fies has written a comic about something deeply personal and meaningful to him. His first graphic novel, the Eisner Award–winning Mom's Cancer, was a biography about his mother's battle with lung cancer. Fies says he writes such stories from a desire to report events, which he attributes to his background as a journalist, and as a way to cope with the loss. "I experienced this extraordinary event," he says, "and I have an obligation to tell the people about it." Fies plans to expand "A Fire Story" into a full graphic novel, and detail the first couple of months after the fire; the original version spans a few days, plus another short entry three weeks later. The redrawn comic will also go into more detail on the day of the fire, such as the frustration he and his wife felt when they initially couldn't get back to their property. He'll also include the fire's greater impact on the region, and other people's stories of the event. 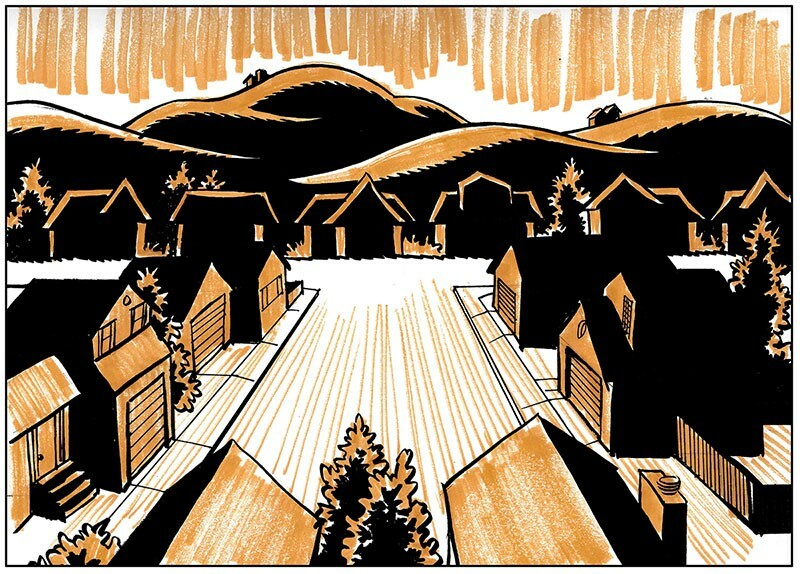 FIRE ON THE MOUNTAIN Brian Fies’ accurate depiction of the North Bay wildfires will be expanded next year into a full-length graphic novel. Fies' wife, Karen, director of Sonoma County Human Services, says the comic "was a way for him to share his emotions and his experiences in a way that was best for him. I think that sharing it with everybody—starting with Sonoma County and then all over the world—has been very wonderful." 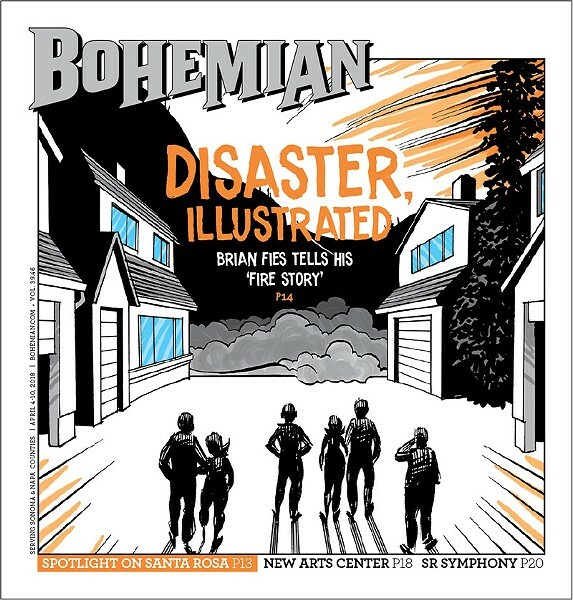 The comic is mostly about Fies' initial reaction, but "A Fire Story" also depicts Karen's efforts to aid survivors, even as she struggles with losing her home. Some of Fies' inspirations as a child were Charles Schulz's Peanuts and Walt Kelly's Pogo. He read a lot of Marvel and DC, and independent comics, as he got older. He's also a big admirer of classic animation, such as Max Fleischer's Superman cartoon from the 1940s. He's even written a webcomic about a character from one of those cartoons, which have since become public domain. After staying in Novato with their daughters, Laura and Robin, the Fies are back in the area and leasing a home in west Sonoma County. Fies says he and his wife plan to rebuild their home. The graphic novel version of "A Fire Story" is still a work in progress, but Fies says to look for it next year.